Here is the simplest sound making module that you can use High/Low to drive it. Just change the frequancy it buzz, you can hear different sound. It is widely used on your daily aplliance, like PC, fridgerator,phones and so on. And you also can create many interesting interactive project with this small but useful module. Just try it!! You will find that creating electronic sound is so funny. 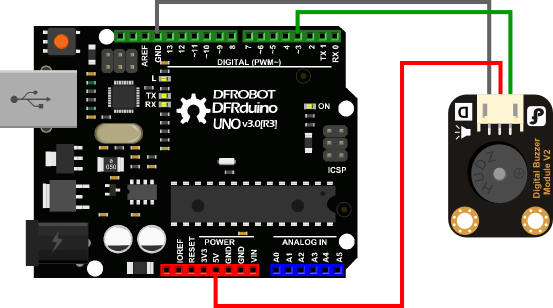 Get Gravity: Digital Buzzer For Arduino from DFRobot Store or DFRobot Distributor.